Material ConneXion of New York announced that Jwall has been accepted into its library of innovative materials. The process was accessed by a panel of creative professionals with material experience and voted in by a majority. Now, Jwall will be displayed in Material ConneXion's four locations; New York, Cologne, Bangkok and Milan. Jwall has now become part of the world's largest innovative materials library, accessed by Fortune 100 companies, architects, designers and more. 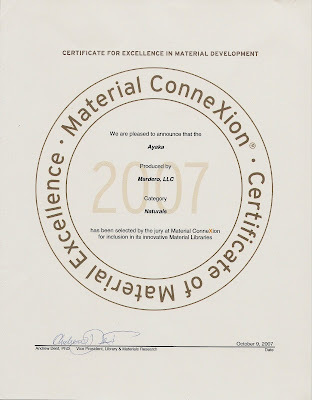 It is our great pleasure to be part of Material ConneXion's library.